While working in GeoGebra I noticed something odd. I had a triangle with a point inside and the point was connected to each of the vertices. For each vertice I had drawn the circle passing through the vertice and the point, with the connection being the circle's diameter (see picture below). What I noticed is that the overlapping circles completely covered the triangle. Further experimentation showed this was also the case if the point was outside the triangle (see below). Is this observation true or did GeoGebra lead me astray? I couldn't immediately find the result via Google. We'll prove the case for $n=3$ and then generalize for an $n-$gon. 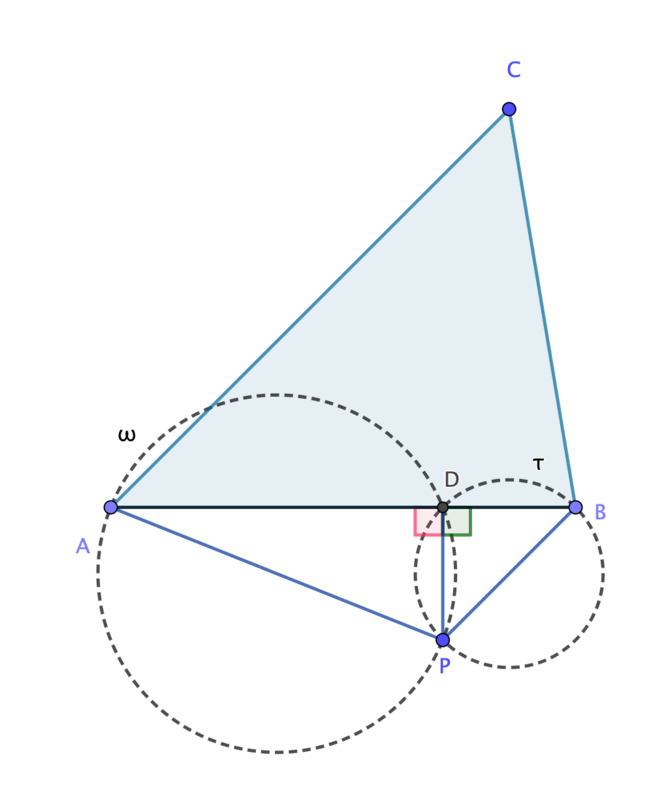 Let $\triangle ABC$ be a triangle and $P$ an arbitraty point (inside or outside the triangle). Consider now the circumferences $\omega$ and $\tau$ with diameters $AP$ and $PB$ respectively. Consider furthermore the point $D\in [AB]$, such that $PD\bot AB$. 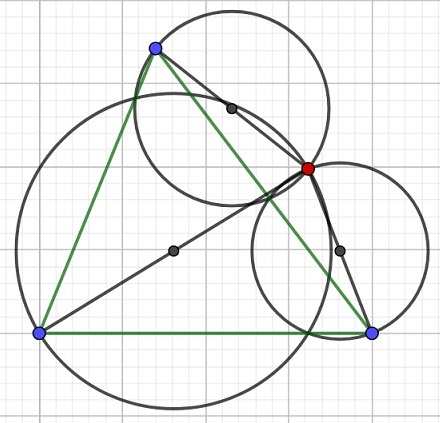 In vitue of the converse of Thales' Theorem $$\angle ADP=90°\implies D\in \omega \qquad\qquad \angle PDB=90°\implies D\in \tau$$ Analogously, we can prove that the intersections of the circles are $P$ and three points $D, E\in BC, F\in AC$ which lie on the sides of the triangles or on the extensions respectively. 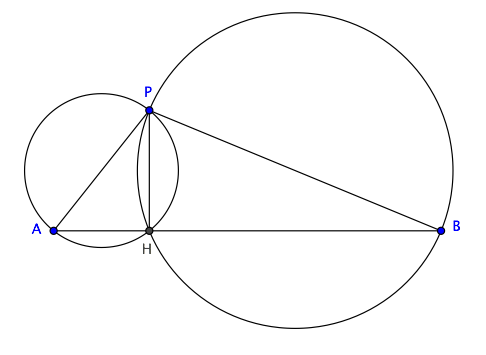 Observe now that the triangles $\triangle PBE, \triangle PEC, \triangle PCF, \triangle PFA, \triangle PDA$ and $\triangle PBD$ are respectively inscribed in the circles $\omega, \tau$ and $\rho$ (with the diameter $PC$). Thus, so is $\triangle ABC$. 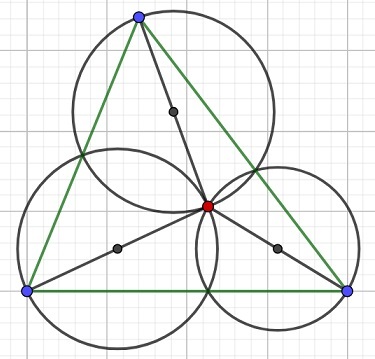 The property you found boils down to the following: given a segment $AB$ and any point $P$ outside it, then the circles having $PB$ and $PA$ as diameter completely cover triangle $ABP$. 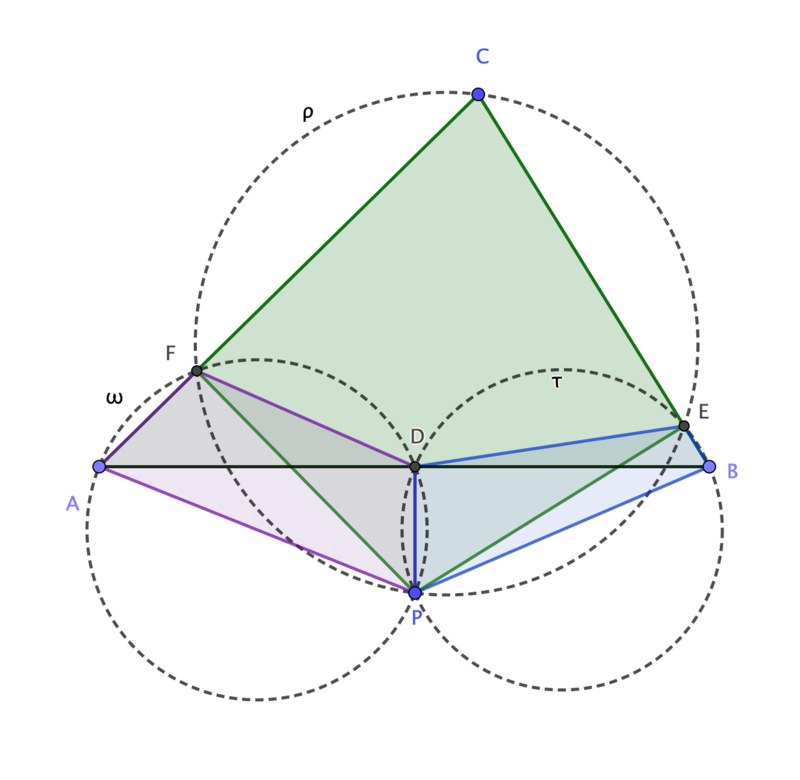 And that is obvious, because those circles are the circumcircles of triangles $APH$ and $BPH$, where $H$ is the orthogonal projection of $P$ onto line $AB$. Not the answer you're looking for? Browse other questions tagged geometry recreational-mathematics or ask your own question. 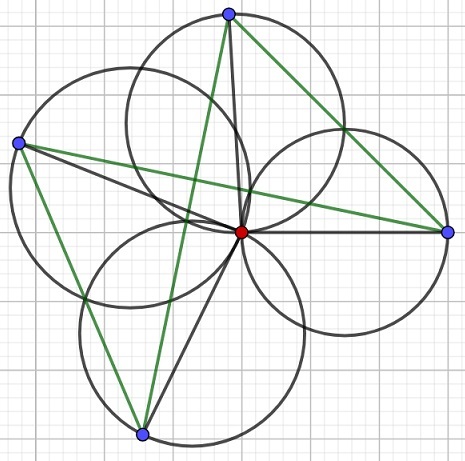 New Golden Ratio Construct: which one of my constructs is superior/simplest--squares & circles or just circles?